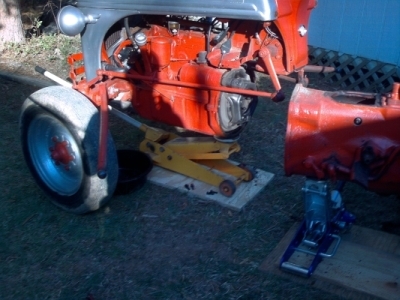 This Page is the Installation of a Sherman Combination Transmission in my 1949 Ford 8N tractor. The 8N can be split without removing the hood, which greatly reduces the number of items that need to be disconnected. But there are still more than just a few things to remove. 1—Battery—Disconnect both cables and the hardware holding the battery in place, then slide the battery out. 2—Both footboards—I removed the two front screws that attach each footboard to the brackets, but in the back it was easier to remove the entire bracket. 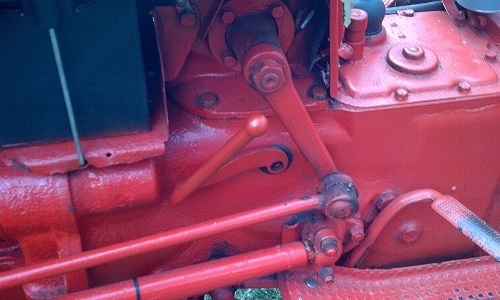 3—Left brake rod—This is located beneath the left footboard. remove the cotter pin between the front clevis and the side of the transmission. This is a little difficult to get at, and the pin was very reluctant to come out of the hole. Once the front end of the linkage was loose, rather than fight the same battle with the back end, I simply unscrewed the rod from the rear clevis bracket. 4—Air tube—I previously bought a chrome-plated aftermatket version of this part. It looked great but was difficult to install and I discovered it was nearly impossible to remove. After comparing the chrome part to my old tube, I realized the aftermarket tube was bent a little different. Lesson Learned—The original part is now back on the tractor. If I had no concience, I'd sell the chrome one on eBay. It hangs on the wall in my workshop as yet another reminder of money wasted. 5—Fuel Line—You could probably get away with just removing one end, but I removed both ends and set it aside where I knew it wouldn't get bent. 6—Choke and accelerator rods—these have spring-loaded ball-and-socket ends that you simply pull out while holding the rod and they should pop right off. 7—Starter wire at the starter switch—Remove the rubber boot on the switch and remove the screw holding the wire to the terminal. Then pull it up and tape it to the dash or coil it in a safe place. 8—Tail Light harness—Disconnect at a convenient spot. These have usually been rewired, so find a convienient spot. You may have to just cut the wire. Try to find a place that is in a concealed location so the splice won't show or get rained on. 9—Radiator cap—This could get pinched or scratch the hood when the steering box is raised, so it's best to remove it now. 10—Make some Wedges—I cut two 6" pieces off the end of a 2x4. Then cut each of those on a diagonal so I had four 3-1/2 x 6" wedges. 11—IMPORTANT STEP!—Two of the wedges should be placed under the front axle center section. One on each side, right where the axle pivots on the engine. See photo above. The wedge is visible just beneath the bumper bracket. A Couple of medium whacks with a hammer should seat them in place. These two wedges are to prevent the engine from pivoting side to side after the bellhousing bolts are removed. 12—Steering box—Remove the bolts holding the steering box to the top of the transmission housing. Also remove the two top bellhousing bolts that go through the battery bracket. Once those bolts are out, you should be able to pull up on the steering arms and break the housing loose. Once it is loose pull up and slide a wedge between the top of the engine and the battery tray to hold the steering box up high enough to clear the bellhousing flange. Photo above shows where I put the wedge to hold the steering box. It's just to the right of the air filter assembly. This is one place where it would help to have another pair of hands. The F0-4 manual says you need a lift or hoist but I managed it by myself. Here is the tractor ready to be split. As you can see, I made a bracket for a trailer screw jack and attached it to the side of the transmission housing. A close-up of that item is next. The bracket is a piece of 3" angle with holes drilled near the edge that line up with two of the bolt holes in the flange between the transmission housing and the rear end housing. You need a heavy duty jack, this one was rated for 750 lbs and was barely adequate. Once you have everything supported, make sure the transmission is in neutral and start removing the rest of the bellhousing bolts. Watch to see if anything moves. If you get any misalignment of the two halves, fix it as the tractor comes apart. 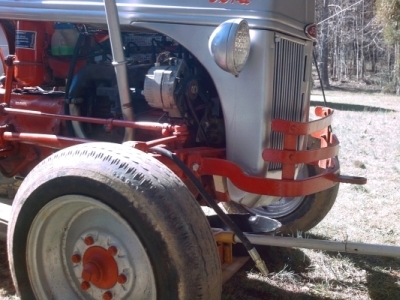 You might need to go up or down a bit on the jacks as the tractor splits to keep things level. A little adjustment here will make it a LOT easier to slide the two halves back together later. Tractor split. The floor jack is under there to steady it while I installed the Sherman. 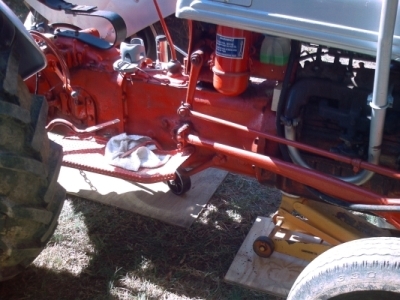 1—Once the tractor is split, remove the left brake pedal, remove and save the key that positions the brake pedal on the shaft, and then remove the brake cross shaft. 2—Measure for the location to put the hole for the shifter. 2-7/16 down from the top flange where the steering box mounts and 5-3/4" back from the back of the starter casting. These measurements should get the hole located within 1/8" or so of where it needs to be. Use a hole saw to cut a 1" hole. This will provide enough clearance to install the Sherman. We will finish this hole out to 1-1/4" later. 3—Remove the two springs and the throwout bearing. Then remove the four bolts that hold the tractor transmission input shaft and tube in place. Set the input shaft and tube aside. 4—Remove the front input shaft and support tube from the Sherman. CAREFUL there is a thrust washer and bearing that go between the input shaft and the output shaft. Set those aside in a safe place, then remove the Sherman rear mounting plate and gasket. 5—Bolt the Sherman rear mounting plate to the tractor transmission using at least 2 shims and one paper gasket. You will need a 5/16" Allen wrench or socket to tighten the bolts. 6—Now, jockey the Sherman into position, don't despair, it will fit. You just need to find exactly the right angle and facial expression or curse word and it will slide right into place. 7—Once you have it in there, put a gasket on the rear mounting plate and start each of the 4 mounting bolts by hand. Don't tighten anything yet just get the bolts started. 9—Leggo of the Sherman and rest a bit, drink a beer, whatever. 11—Once you have determined the correct number of shims needed (if any) pull the Sherman back out and apply Permatex #2 sealer to the rear mating surfaces of the Sherman and the mounting plate and reinstall the mounting plate and Sherman. Make one final check of the bearing preload as it goes together, just to be sure. 1—Replace the thrust washer and needle bearing on the front end of the output shaft. I used a little grease to hold it in place. 2—Then pour 2 pints of gear/hydraulic lube into the Sherman housing. Use the same stuff you put in the tractor sump. Don't skip this step! The Sherman needs to be full of gear lube before use. 3—Install the Sherman input shaft and support tube back onto the housing (use Permatex on this gasket also). 4—Now, with the Sherman in place we need to finish that hole we made for the shifter. The hole needs to be 1-1/4" in diameter and centered exactly on the shifter mounting point. You can use a die grinder to finish the hole. I used a grinder to start but found it was easier to finish the rest of the hole using a 1-1/4" hole saw without the pilot bit. Then I smoothed the edges with the grinder. 5—Install the rubber grommet and bolt on the shifter. 6—Turn the input shaft of the Sherman to be sure it's free. 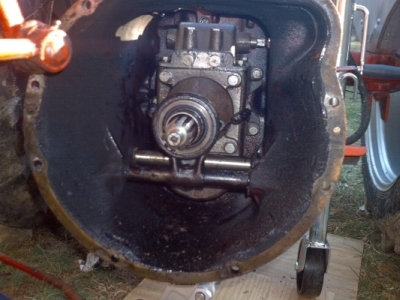 While still turning the input shaft, shift the Sherman through it's gear positions to verify it is shifting correctly. 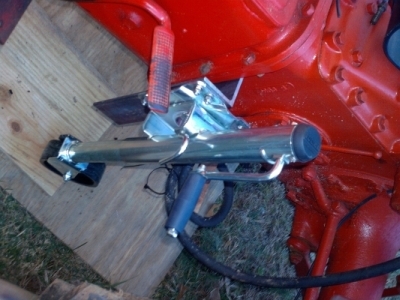 7—Reinstall the brake cross shaft, key, and left brake pedal. 8—Reinstall the throwout bearing and two return springs. 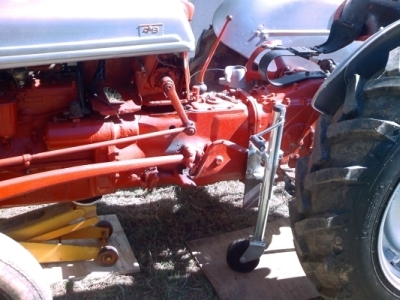 9—Remove any temporary supports and get the two halves of the tractor lined up. They must be completly level and square to each other. This is your last chance to inspect clutch disk, flywheel ring gear, and starter for wear. 8—Next time I do this I will make two dowel pins to help line things up. Get two long bolts that match the threads in the back of the engine, cut the heads off, and grind smooth. Install these hand tight on opposite sides of the bellhousing and use them to help align the two halves of the tractor. 9—Roll the rear half forward and use a box-end wrench on one of the pressure plate bolts to turn the engine and align the input shaft splines with the clutch disk. 10—The two halves should go together smoothly with a little rocking back and forth or fine tuning the jacks. Don't force it!! Figure out what the problem is and correct it. 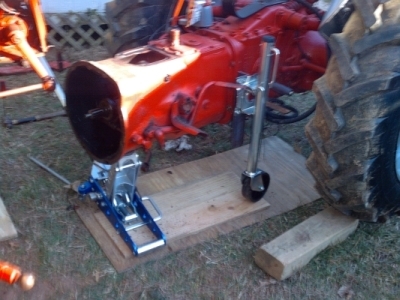 I just got done splitting two tractors to make one good one and discovered two floor jacks is all I needed. One on each half, and I used a come-a-long to help draw the two halves back together. Replace bolts in bellhousing and the rest is simply the preliminary steps in reverse order. Don't forget to knock the wedges out from under the front axle.